What could be better than going to the zoo on a beautiful Saturday afternoon? 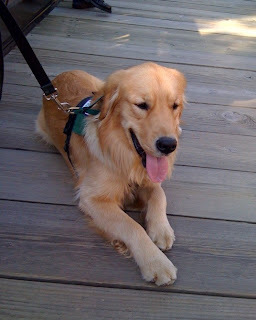 Going to the zoo with a service dog-in-training! 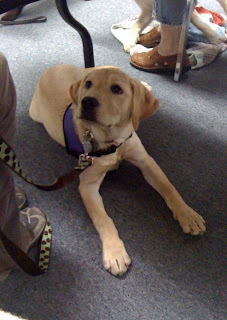 Fifteen service dogs-in-training went to Zoo America for a puppy class outing. Throughout the year, we take the dogs on several outings so the dogs get experience working in public. Although our puppy raisers frequently take their dogs out in public, these special planned outings are also helpful for the puppy raisers because it gives them a chance to work in public while our trainers are right there to give support and answer any questions they might have. Our Zoo America is always a fun outing, and it's a wonderful opportunity for the dogs and puppy raisers to practice their skills. 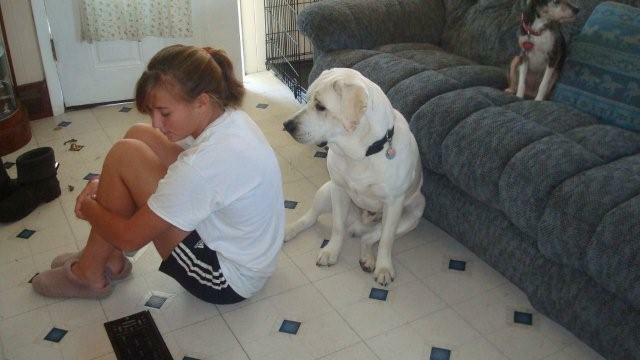 With so many distractions, it's a challenge for the dogs to stay focused. 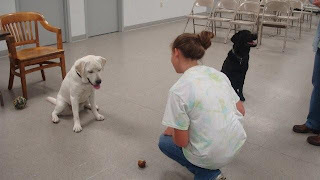 Our puppy raisers were ready with power treats (treats like chicken, cheese, or other yummy things that the dog only gets in challenging situations), which really helped the dogs stay focused on their handlers. Because the dogs were around so many different animals, it was a great opportunity for puppy raisers to practice reading their dog's body language. They needed to watch their dog to make sure that they weren't becoming too excited or stressed from the zoo animals. For example, when we stopped at the wolves' area, we paid special attention to the dogs, and if they started to get too excited, or started barking, the puppy raiser removed them from the area. SSD Topaz approaches the wolves in this video. You can tell from his body language that he is aware of the wolves, which are about twenty feet in front of him. However, he is still able to focus on this puppy raiser - see how he turns and looks at her? As soon as he gives her his attention, she clicks and treats. In addition to watching the dogs' body language, we also paid close attention to the zoo animals' behavior because we did not want to upset them or cause too much stress. We had to be especially watchful in the wolves' area, because as soon as the alpha wolf smelled the dogs, he started pacing. If he and the females of the pack started to get stressed, we removed the dogs, even if the dogs were just sitting there quietly observing. In this video of the wolves, you can see the male wolf pacing back and forth. You can tell that he's very aware of the dogs, although at this point he is not overly stressed about it. All of the dogs were very interested in the wolves. Can you guess what other animal almost all of the dogs were extremely interested in? The fish! At the bears' area, you can watch the fish through the glass, and almost every dog that saw them was fascinated by them, especially since they have probably never seen a fish before. SSD Topaz wasn't entirely sure what to make of the fish, but he did a great job and didn't bark at them. SSD Star and Falcon also though the fish were fascinating, but they are not so distracted that they can't pay attention to their handlers. Watch how Star's puppy raiser works with her to get her to walk nicely on a loose leash. Once they get to the fish, Star does an "up." SSD Hendrix, on the other hand, wasn't interested in the fish at all. SSD Journey, one of our dogs in advance training, spent some time near the bear's habitat. She seemed much more interested in her puppy raiser than in the bear, though. Even when her puppy raiser pointed to the bear, Journey just looked and then turned right back to her puppy raiser. Wonderful! One of the most important skills a service dog can have is the ability to walk on a loose leash. Throughout our entire zoo outing, we continually worked on loose leash walking, which can be very challenging for dogs, especially when there are such great smells around. Loose leash walking is all about self control for the dogs. They need to ignore distractions and stay right next to their handler. In this video, SSD Grace works on loose leash walking. Watch what Grace's handler does when Grace starts to pull ahead. He stops, backs up until Grace comes back to him and turns around. Then when she starts loose leash walking again, he clicks and treats. Why is loose leash walking so important? 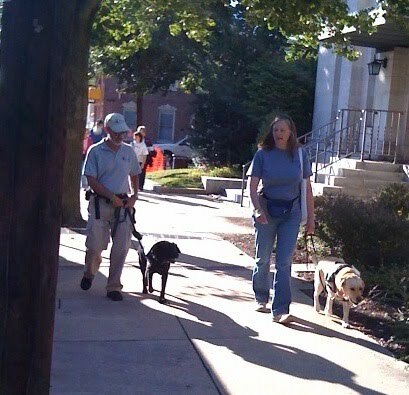 Imagine a balance dog and their partner walking along the sidewalk to get to the car. As they get close to a tree, the dog smells something wonderful. He lunges to get to it. His partner is thrown off balance and falls. 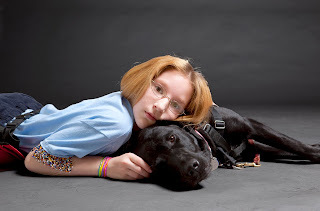 Now picture a service dog for a child with autism. While the parent is holding the leash, the child is holding a special strap attached to the dog's harness. If that dog pulls on the leash, the child is going to be pulled as well. Loose leash walking is important, and the dogs need to do it all the time, in every environment. The zoo was a great place to practice! Thank you to Zoo America! We try to plan several outings for the dogs-in-training, and we're always open to suggestions. We look for places that have lots of sights, sounds and smells. For example, we've done a Ghosts of Gettysburg tour, Chocolate World, a memorial day parade, a bus ride, and National Night Out. If you have any ideas for other places in Central PA where we could take the dogs-in-training, please let us know in the comments. Thank you! Team Training was full of fun and games today! 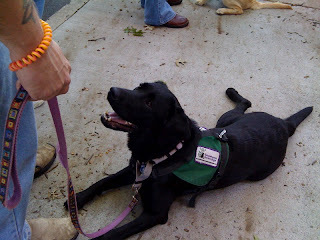 We went to the Whitaker Center for Science and the Arts, where our new service dog teams practiced their skills. There's always something new at the Whitaker Center, and this time was no different. On November 10, Bret Michaels is coming to the Forum, and in honor of his appearance, the Whitaker Center created navy blue bandanas, which are Bret Michaels' signature item. 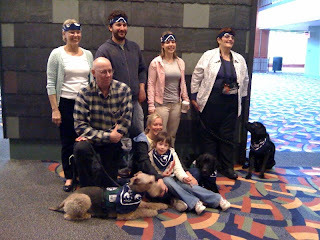 All of our service dogs, partners and trainers got to wear one of these bandanas. They even let us keep the bandanas! 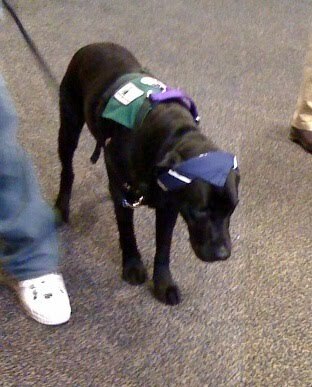 While dressing up in the bandanas was fun, it was also a nice training experience for the dogs to let their partners dress them in something other than their service dog harness. SSD Phillip sported the bandana just like Bret Michaels - folded and tied around his head - but Phil decided it wasn't quite his style, and he wore it around his neck for the rest of the outing. The Science Center at the Whitaker Center is a wonderful place for the service dogs and their partners to practice their skills. There are all sorts of distractions, from loud noises like the rain machine and the earthquake simulator to visual distractions such as floating beach balls and fake food in the children's area. Because it's getting close to Halloween, there was a special table set up where children could learn about pumpkins. SSD Phillip's partner loved this area! Not only did she learn whether a pumpkin floats or sinks in water, but she also got to explore the insides of a pumpkin! Watch the video of her removing the seeds. Notice how SSD Phillip hangs out at her feet the entire time she was at this table. SSD Caspian and his partner enjoyed going through the different exhibits. In this video, Caspian is very interested in the whiffle balls spiraling in the funnel, but he is still able to pay attention to his partner. In addition to practicing their skills (and having fun!) 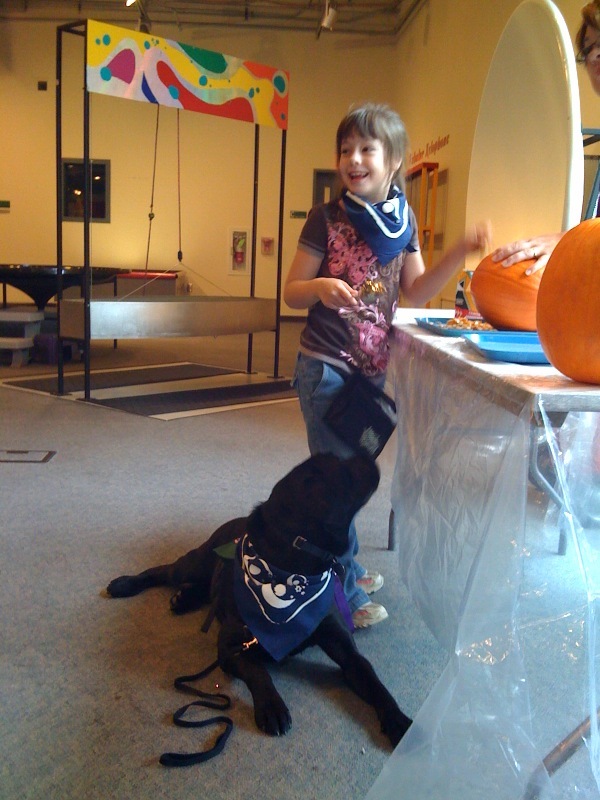 in the exhibits, our service dog teams worked on skills that may seem simple but are still very important. They practiced getting on and off the elevator, and going up and down stairs. At the elevator, the dog must wait until their partner blocks the doors to keep them from closing. Then, when they receive the cue "go on through," the dog walks into the elevator, turns around and looks at their partner. Their partner can then move all the way into the elevator. The process is the same for exiting the elevator. It's especially important to enter and exit the elevator properly because you don't want the doors to close while you are inside the elevator and your dog is outside. On the stairs, dogs must walk calmly beside their partner without pulling. If a dog barges up or down the stairs or pulls on the leash, he may cause his partner to fall, and the risk of injury is much higher on the stairs. Watch how SSD Teddy walks calmly next to her partner as they walk up the stairs to the next floor of exhibits. Thank you so much to the Whitaker Center! 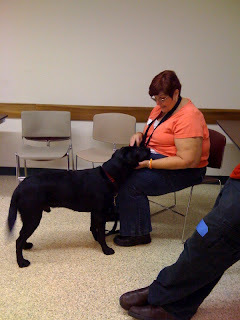 It's a great training experience for the dogs, and we always have a wonderful time! Happy birthday, Nubble! He is now one year old. Wish him happy birthday and send him a birthday gift! Nubble and his puppy raisers were shopping in Target on his birthday, and he wore a birthday hat the entire time. To celebrate his birthday, they let him pick out a new toy, and then he and Gizzy, his puppy raisers' family dog, shared a special birthday dinner that evening. Last Wednesday, Donna and Lindsey brought doggie cupcakes to puppy class. Of course, we turned it into a training opportunity and had the dogs practice self control. 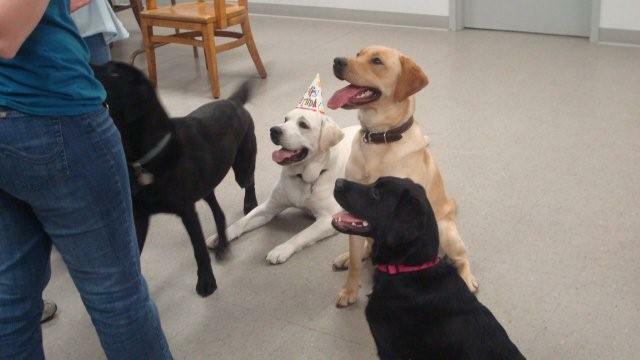 Each dog had to be patient and get their photo taken before they could have a cupcake. The dogs loved their treats! 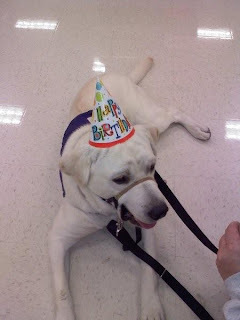 Nubble's puppy raisers took him to PetSmart. Although it was very challenging for Nubble because of all of the dogs that have marked in there, he still did well. There were a few other dogs in the store at the time and they barked at him. However, Nubble didn't bark back! Instead, he turned and looked at Donna. Great job, Nubble! Nubble's self control has been improving a lot. When he sees something he wants to chase, he looks at Donna and thinks twice about whether he's actually going to chase it. He no longer chases Baby the Cat, even when she tempts him by running right in front of him. Instead of chasing her, Nubble just looks at Donna. Donna is especially glad that Nubble leaves the skunks alone. They have had quite a few skunks wandering in their yard this past month, and although Nubble knows they're there, he leaves them alone. Just in case, Donna only takes him on short walks when the skunks are out! 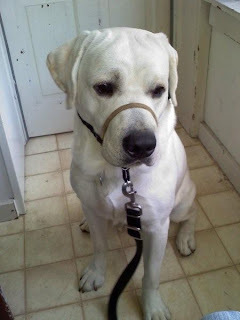 Nubble has been wearing the comfort trainer on a regular basis now, and it has really helped prevent him from pulling. Although he still tries to get it off if he's standing still, he has no problem with it if he's occupied and moving. Just in case he does get the comfort trainer off, Donna attaches a second leash to his collar and secures it to her waist. At last Wednesday's puppy class, the Northeast Division worked on loose leash walking at different speeds (fast, slow, run, walk, etc.). If Nubble's leash is only attached to his collar, he has a difficult time switching speeds. But with the comfort trainer, he can change speeds easily without yanking Donna off balance or getting overly excited. Donna has even been able to take him jogging when he's wearing the comfort trainer. "I am enjoying jogging with him now," says Donna. "I had been doing some with him when he was young, but I had to stop because his speed and strength far exceeded mine. Now, it is enjoyable again." They have also been working on shaping. Nubble has actually learned how to trim his nails himself! No, he doesn't use the clippers. Donna has shaped him to scrape his nails on a rough board, which trims and files them. He only does his front feet right now. She is still working on shaping him to do his back feet. Shaping him to use his back feet on the board will accomplish more than just teaching him to trim all of his nails. It will help him become aware of his back legs and feet and understand that he can move his back feet independently. Keep up the good work, Nubble! Happy birthday! Team Training is an intensive, two and a half week training for people and their new service dogs, but it's not all hard work. We take plenty of time for fun and games, too. After all, isn't it more fun to learn while playing a game? To review some of the new cues and knowledge about dogs that the new partners learned, we played Jeopardy. Then we put that knowledge to the test in the game D-O-G. The game D-O-G is similar to the basketball game H-O-R-S-E. We divided into two teams. One person and their dog had to perform a cue, such as "down," and the other team had to send a service dog team forward to do the same cue. If the other team successfully performed the cue, then play continued. If they couldn't do it, they received a "D." The goal of the game is to NOT spell the word "dog." We had a lot of fun playing D-O-G! We practiced cues like "take it," "lap," and "visit." We even did "leave it" with an open tube of peanut butter - quite a challenge for the dogs! In these videos of the game, Caspian picks up his partner's cane, Jasmine does "lap" for a hug and a kiss, and Teddy visits with her partner. We're now in our second week of Team Training, and we're starting to practice in public. Wish the teams good luck! Young puppies are sponges when it comes to learning new things, and the Gemstones and Flowers are no different. Aqua, Opal and Topaz (the Gemstones) and Daisy and Dandelion (the Flowers) attended Early Socialization Class at the kennel on Wednesday. Because it was a gorgeous evening, we let all of the puppies run in the field, which is an enclosed, woodsy area. The pups had a great time playing! Of course, we turned their time in the field into a training opportunity, and we practiced recalls. Each puppy raiser went to a different part of the field while the dogs were running around and then called their dog to come. They did great! 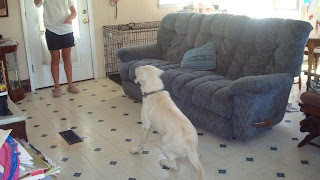 In the following video, Opal is in the process of begging for treats from Topaz's puppy raiser. But when her puppy raiser calls her, she bounds straight over to him. It was starting to get dark, so we moved class from the field to the training room. And of course, we turned the relocation into another training opportunity. One at a time, each puppy and puppy raiser practiced loose leash walking from the field to the training room. Daisy demonstrates loose leash walking in the next video. The leash is nice and loose, forming a "J," and Daisy is focused on her puppy raiser. 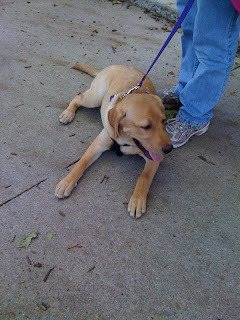 Topaz's puppy raiser does a nice job getting Topaz refocused for loose leash walking. when he starts to pull, she backs up so Topaz can't reach what he wanted. She then turns in a circle to get him reset, and they continue on their way. Look at how nicely Topaz walks on a loose leash after that! Once everyone was inside, we went over all of the cues in the puppy manual. When puppy raisers first get their puppies, we give them a bag full of goodies for the dog (tug toy, ear wash, heartworm and flea and tick meds, leash, etc). We also give them a puppy manual that contains information about dog health, clicker training, shaping, socialization and more. In the back is a list of all of the cues the puppy raisers will be teaching their puppies. Now, we did not go through the list of cues because each puppy needs to know them by the next class. We went through the cues so that our puppy raisers were aware of what they are. It's important to use a verbal or hand cue only once the puppy has learned a behavior. Otherwise, the word is just going to be meaningless to the puppy. Or the puppy might start to learn that the cue means something completely different than what you intend it to mean. For example, if you see your puppy starting to lunge for some food on the floor, your instinct might be to say the cue "leave it" as you pull the puppy away from the food. When you say "leave it," you mean "ignore that food on the floor and look at me." But if the puppy doesn't know that behavior and he always hears the "leave it" cue as he's pulling towards food, he could interpret "leave it" to mean "pull really hard to try to get that tasty food on the floor." So it's important not only to wait until the puppy knows the full behavior before adding the cue, but also to be aware of what the cues are so you don't inadvertently start using one before the puppy is ready. We spent some time practicing "leave it." To start, each puppy raiser held some kibble in a closed hand. Of course, the puppies wanted to get the kibble, so they nosed at the hand. The second their puppies stopped trying to get the food and looked away, the puppy raisers clicked and treated with food from their treat pouches. It didn't take long for the puppies to learn that they'll get treats for ignoring the food in the hand. Watch Aqua quickly give up on trying to get the food out of her puppy raiser's hand. By the end of one training session, some of the puppy raisers were able to leave food in an open palm and the puppy would ignore it. Watch Dandelion . She ignores a whole pile of food in her puppy raiser's open palm. Notice that when she does turn her head toward the food, her puppy raiser immediately moves his hand out of her reach. Soon she is staring intently at her puppy raiser, ignoring the food next to her head. 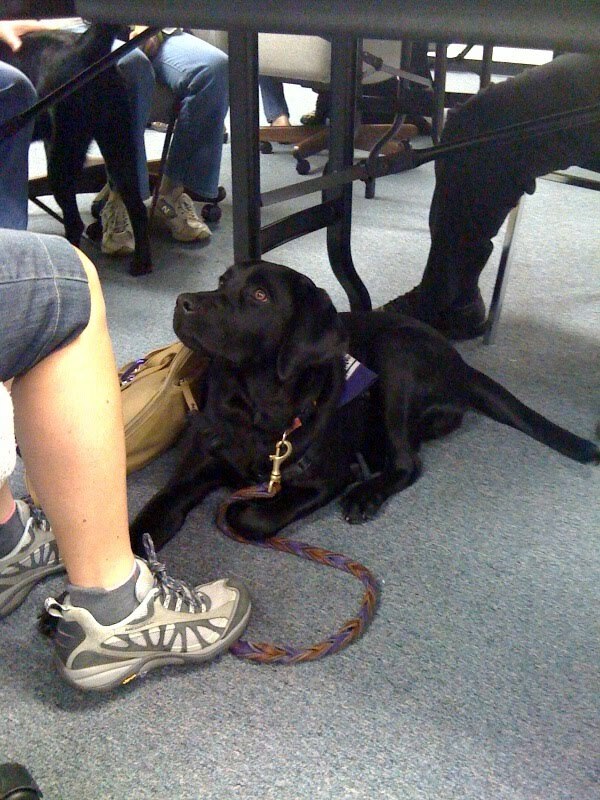 This was an excellent early socialization class! We can't wait to see what these puppies will learn by next week! Yesterday was the first day of Team Training! SSD Caspian, Jasmine, Phillip and Teddy are learning how to be a team with their new partners. 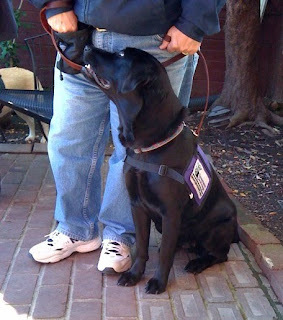 This is a very exciting time for us, when we get to watch the bonds form between each partner and their service dog. After spending the morning learning about clicker training and shaping, the partners finally got to work with their dogs. When we first bring the dogs out to their new partners, the partners give the dogs lots of treats and attention so that bond begins to form. In this video, SSD Teddy bonds with her partner. SSD Caspian was very excited to see his new partner. Look at that tail go! 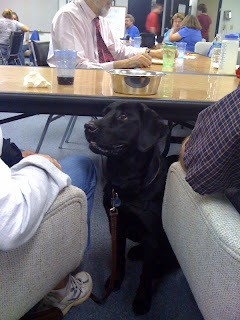 Once each partner had given the dog lots of "free" treats (free treats are treats that the dog didn't have to do anything to earn), they practiced clicking and treating the dog for attention. Every time the dog looked them in the eyes, they clicked and treated. Then the partners learned their first cue - "come." In this video, Caspian trots over to his partner when she calls him to come. Teddy hurries over to her partner when he calls her. Because of the tile floor, Teddy's feet slide a little, but that doesn't stop her from coming right to her partner. After all of the teams had successfully practiced "come," we started working on "down," the cue for the dog to lay down. In this video, SSD Jasmine gently slides into a down. Notice how her hip is rolled. She's relaxed. Here, SSD Phillip listens to his young partner when she asks him to "down." Look at how he watches her after she gives the cue and smiles after he gets his treat. Next we combined the cues "come" and "down," having the partners call their dogs to come and then ask them for a down. Watch how Phillip walks calmly over to his partner and slides into a down when she asks. Another cue we practiced was "leash." The dogs can be trained to pick up their leash and hold it until they're given the cue to release it once their partner has it in their hand. Jasmine was very enthusiastic about picking up her leash. In fact, she offered the behavior without waiting for the cue! Although she didn't get clicked and treated for picking up her leash without the cue, it may be a sign that she's thinking and trying to figure out what her partner wants. 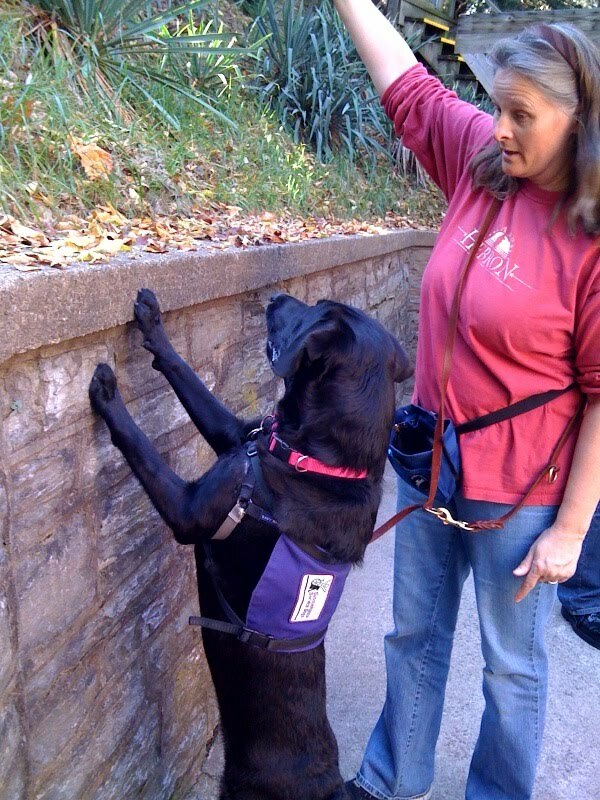 This is an important trait in a service dog because the dogs will encounter all sorts of different situations and sometimes they may even need to do some problem solving in order to give the cued behaviors. For example, the leash may get caught around the corner of the sofa and the dog will need to figure out that he needs to pull the leash free before he can pick it up and give it to his partner. In the video, Jasmine picks up her leash on cue. We had a successful first day of Team Training, and we're looking forward to the rest of it! Thank you to the puppy raisers who did such a great job raising these dogs! Raising puppy to be a service dog can be a lot of work, but it is also a lot of fun and sometimes even makes you laugh out loud at the antics of the dogs. "Nubble is a goofball. He makes me laugh every single day," says Donna, Nubble's puppy raiser. "He is so exuberant and bubbly." In a previous post about Nubble, we mentioned how he picked pepper's out of Donna's friend's garden. Well, he was up to more tricks in Donna's garden. He picked one of her pumpkins! He had it in his mouth and ran around the yard with it. The pumpkin barely fit in his mouth! Training opportunities are everywhere, and it's important to recognize them and take advantage of them. In another instance, Nubble managed to get a potato out of Donna's bag of potatoes in the kitchen. From another room, she heard Nubble tossing something around, and sure enough, he was playing fetch with himself with potato. Once again, she turned it into a training opportunity, asking Nubble to "leave it." He is getting very good with that cue. When he knows that he is supposed to leave something, but he really, really wants it, he gets a little frantic. Donna can almost see the inner battle going on in him. He keeps looking back and forth between her and the object and takes the treats as if he's desperate to stay focused. But once he wins that inner battle, he calms down. He is maturing constantly. By now you probably know that stairs are a big challenge for Nubble. He and Donna have been working hard to conquer the stairs. 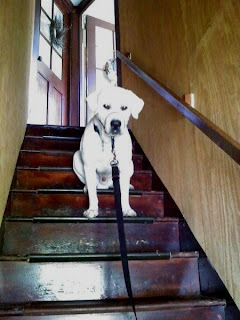 Donna found a stairwell where they can work off leash without having the worry about Nubble running off or being distracted by other people. Her sister's apartment building has an enclosed stairwell with doors at the top and bottom. Donna has been shaping Nubble to to up the stairs. At first, he wouldn't even go up the first step. Then once he conquered that first step, he dashed up the rest of them. Donna worked with him and got him to slow down nicely. However, as soon as she put the leash on him, he didn't want to take that first step. When Donna took the leash off again, he was fine. The Northeast Division trainer suggested practicing with the leash attached but without Donna holding it, so they're going to work on that. Going down the stairs, Nubble did fine, although he did want to leap down the last three or four steps. By the end of last weekend, though, he was doing much better. They have also practiced stairs when Nubble was wearing his comfort trainer, a head halter. Donna had the leash attached the halter, and as soon as they went in the door leading to the stairs, Nubble went right to work. He didn't even rush up the stairs! 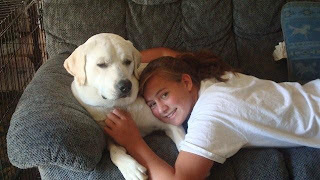 It was like he was a completely different dog. He may not have completely conquered stairs yet, but Donna is definitely seeing progress. 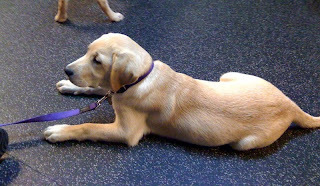 In puppy class, Nubble is learning to give a behavior no matter where or how the cue is given. 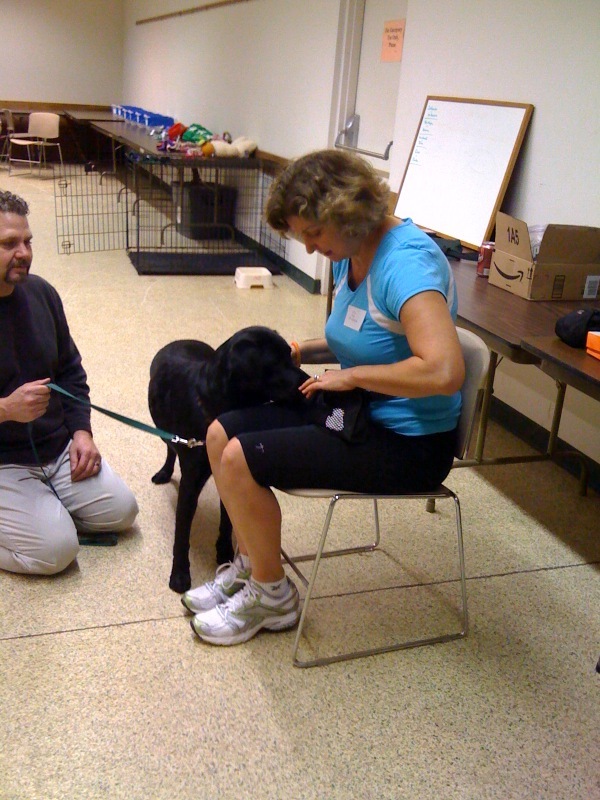 To practice, they had the dogs sit and puppy raisers sit with their backs to the dogs. They then gave a cue and the dogs had to learn to follow it despite the fact that their puppy raiser didn't seem to be paying attention to them. Nubble caught on quickly! Another game they played was putting the dog in a "down" and then crawling away. At first, Nubble thought it was playtime! Donna is working on it at home, and he is starting to do very well with it. They also practiced recalls. However, there is a twist. They asked Nubble to do a "down" halfway through his recall. He's getting very good at it! 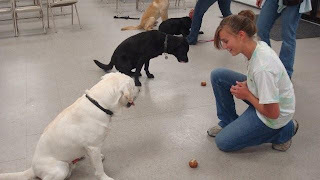 These types of games are very important for the dog's training. Nubble is learning to give behaviors in any environment, no matter what his handler is doing. It's great preparation to be a service dog, because service dogs will need to be able to assist their partners no matter where they go. Keep up the good work, Nubble! In the past few weeks, we have given several demonstrations for United Way of the Capital Region. If you work in the Capital Region, your company may have kicked off a giving campaign for United Way, and you may even have seen one of our dogs. United Way is a wonderful organization that raises money for the community's needs, and they donate that money to organizations that are working to meet those needs. United Way funds organizations that support families, seniors, children and youth; provide emergency food and shelter; address disease and disabilities; and build stronger and safer communities. They are working to change lives. Please consider making a donation to United Way. Susquehanna Service Dogs is a partner program with the United Way, and we would love for you to donate to us through the United Way. But all of the partner programs and agencies of the United Way are working to change lives, and no matter which program you choose on your United Way donation form, you will know that your gift is going to an organization that is truly making a difference in people's lives. We are working to change lives by training service dogs. Team Training is starting next week, when several people will receive their new service dogs and learn how to work together as a team. The moment we bring the dogs out to their new partners, the room is filled with happiness. After receiving her service dog, one woman said, "It's like I have my life back." We would not be able to change lives with you. 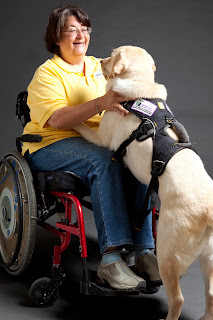 Your generous support helps us to specially train service dogs to perform the unique tasks for each person's needs. 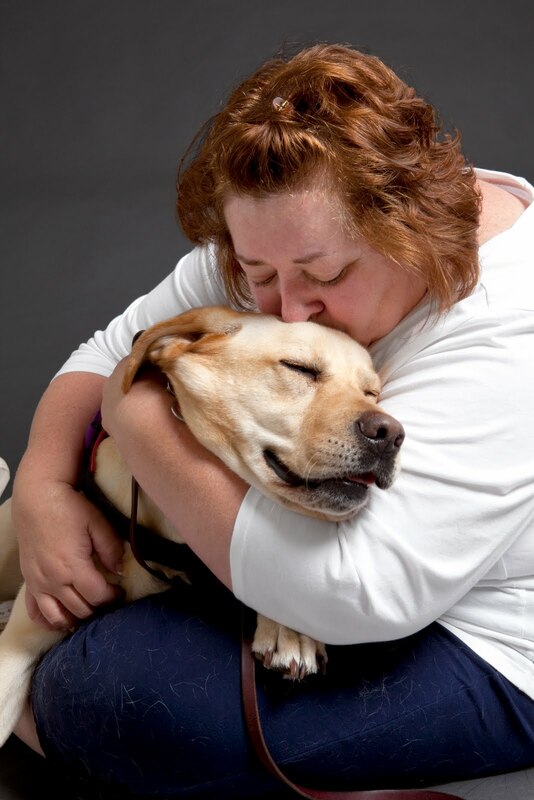 If you donate to us through United Way, you won't find Susquehanna Service Dogs in the list of program partners. In order to donate to us, you will need to select Keystone Children & Family Services. SSD is a program of KC&FS, so you can be assured that your donations to KC&FS will come to us. Thank you so much for your continued support. We wouldn't be able to do it without you. 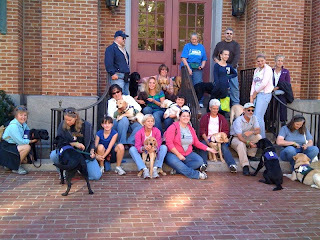 Some of our service dogs-in-training went on a Ghosts of Gettysburg tour. We don't know if they encountered any ghosts, but they did have lots of opportunities to practice their service dog skills. While our guide shared stories about the haunted buildings and other ghost encounters, the dogs practiced calm down-stays. This was especially challenging because there were 14 dogs on the ghost tour! Additionally, most of the dogs were in a brand new place, which always makes it more challenging to give behaviors. However, the dogs settled down quickly and relaxed next to their handlers. 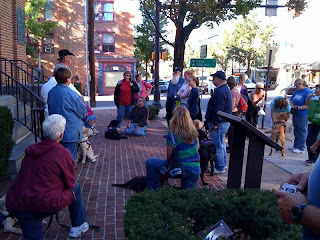 The dogs also got to practice loose leash walking in town. It's important for the dogs to learn how to walk on a loose leash in all types of environments. A dog can do great loose leash walking in a rural development, field, or parking lot, but then when they walk in the city, they may forget that they ever knew how to walk on a loose leash. Walking through the streets of Gettysburg was great experience for the dogs. You never know where their future partners are going to live. Although we don't know about ghosts, the dogs did encounter two horses. While we were listening to our guide, two horse-drawn carriages pulled up. Some of the dogs immediately started barking at the horses. Our puppy raisers handled it very well calming their dogs. Some of them blocked their dog's view of the horses and gave treats when the dog gave their puppy raiser attention. Other puppy raisers took their dogs farther away from the horses until they calmed down. Overall, this was a great outing! We had a lot of fun. Thank you to the Nesbitts for donating the Ghosts of Gettysburg tour! And thank you to our wonderful guide, Bill! Sixteen dogs, over 25 people, countless dishes of delicious food - do you think it's possible for all of that to be in one room without mishaps? We think so. In fact, we know so. On Wednesday evening, we held our annual Dinner with the Dogs. Puppy raisers and the dogs-in-training met in the big conference room at Keystone Children & Family Services so the dogs could practice table manners during a meal. We hold a potluck-style dinner in the conference room rather than go to a restaurant so we have more control over the environment and can set the dogs up for success. The food was delicious, and the dogs did a wonderful job! During the meal, you wouldn't have known that there were 16 dogs in the room. The dogs lay under the table and practiced becoming "invisible." 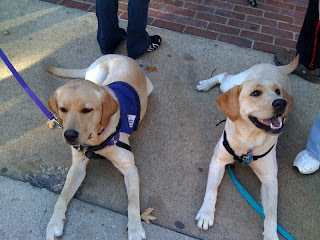 Even the young puppies did a great job - which in turn means that their puppy raisers are doing great! When we're teaching table manners, we often wear our treat pouches or keep a cup of kibble at the table, so we can reward the dog for good behavior. If the dog is in a nice, quiet down-stay, we will reinforce that behavior by giving him a treat. Because there were so many other distractions at our Dinner with the Dogs (smell of food, lots of people and dogs), our puppy raisers used power treats like cheese whiz, chicken, and hot dogs.